First things first: you have to make sure you have, or purchase, a Corio2 unit which can output 240p - not all can. In a nutshell, a good clue if the Corio2 you’re looking at can output 240p is to look for models which are marketed as an "upscaler" or “scaler” – those seem to be able to output 240p. Models which are advertised as "downscalers" or “down converter” seem to NOT be able to output 240p and should be avoided. I know this is counter-intuitive, but that's what we've found so far. Another clue, not confirmed or anything, but if it ONLY has YPbPr/Component outputs on it – i.e. no VGA output (not to be confused with the “loop” VGA Out some have, which simply repeats the original inputted signal without any scaling), no DVI, or no 5x BNC’s for RGBS or RGBHV outputs, it might not work (haven’t found any like that which work yet). Models with only Composite or S-Video tend to not work either (240p can only be output via RGBS or YPbPr-type connections it seems). C2-2200A RGB out, confirmed by multiple people, NOTE: I’ve had 3x units (out of ~7, from 3x different sellers) give me error fault codes on occasion though, I would NOT recommend this model anymore. *all these are the same line as the 2200A’s which work, are all marked as “scalers”, but haven’t had these confirmed 100% as working by anybody to date. **2x people tested C2-21XX models and 240p wouldn’t work...I can’t confirm 100% that ALL of these C2-21XX models won’t work, but I would stay clear of them - especially coupled with how models which ONLY have YPbPr out don’t seem to be able to output 240p. They also say they’re “down converters” which is a keyword to avoid. ***these are some newer and sometimes VERY expensive models, but they use the same Corio2 chip, and I have the 6104 which is from a similar series and that will output 240p to my flatscreen (well, technically a 2x2 grid of 4x 240p consoles), but these models seem promising at the very least if you can snag one for a good deal. Last edited by Dochartaigh on Thu Nov 08, 2018 1:48 am, edited 8 times in total. 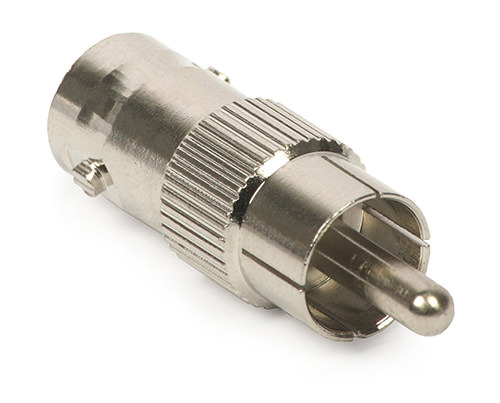 (these are commonly used for the output side to plug into a consumer CRT with Component inputs - you would need ones with a female RCA if you’re plugging Component RCA cables into the input side of course). If using a VGA system like Dreamcast for example, you wouldn’t need any of these and simply use a regular VGA cable plugged directly into the Corio2. The Corio2’s seem to auto-sense both the connection type and resolution. I’ve NEVER had to manually set the input type on any system (YMMV of course). 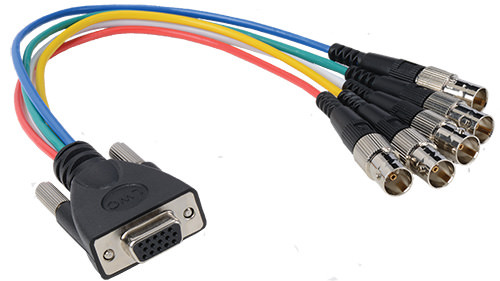 If you use SCART (which is a little rare for 480p, but I have used that on PS2 for example over RGsB), and you want to get it into your Corio2, you might have to be a little more creative: using a SCART to BNC break-out cable, then connecting the BNC’s off that, to another break-out cable like the BNC to VGA shown above might work -- but I’ve never tried this myself. If you have any sync issues please be aware that a SCART to BNC cable is wired differently than a BNC to SCART cable (the pin used for sync, and I believe audio, move depending on the direction). Like I’ve mentioned on Facebook and Reddit, I mainly use these for 480p to 240p downscaling on gen 6th systems (as downscaling 480p to 240p will always come out the best). 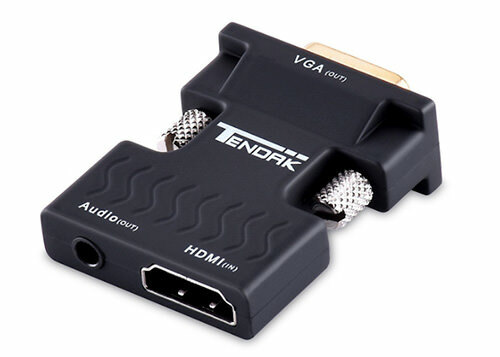 I have however had good luck in using an inexpensive HDMI to VGA adapter made by Tendak Active 1080P Female HDMI to VGA Male Converter to get HDMI systems into the Corio2. This is one of the adapters the OSSC people recommend and has been widely tested (although for a slightly different use). Some people like other more expensive models (I’ve heard HDFury2 is good), so try them out and see what works for you. I’ve been able to downscale, through HDMI, my Xbox One X (1080p), and Xbox 360 (720p). Others have had good luck with PS3 (over HDMI to VGA only - one user reported problems with HDMI to DVI possibly because of HDMI HDCP handshake issues), Nintendo Switch, PS4 Pro, and PSTV. PLEASE LET ME KNOW IF YOU TRY OTHER HDMI SYSTEMS SO I CAN ADD THEM TO THIS LIST! Last edited by Dochartaigh on Tue Sep 11, 2018 11:33 pm, edited 1 time in total. 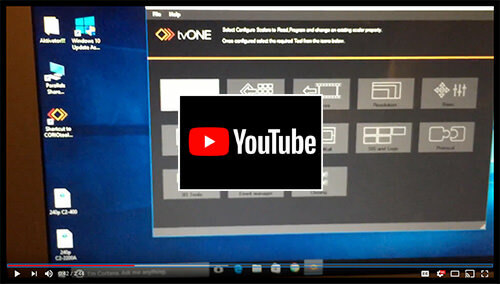 Since you don’t know where your Corio2 unit came from I HIGHLY SUGGEST going to the TVOne website, downloading the most recent firmware, then loading it on your Corio2 unit so it’s back to factory settings. If you ever have a problem with the unit I also suggest reloading the firmware on it again and starting fresh. 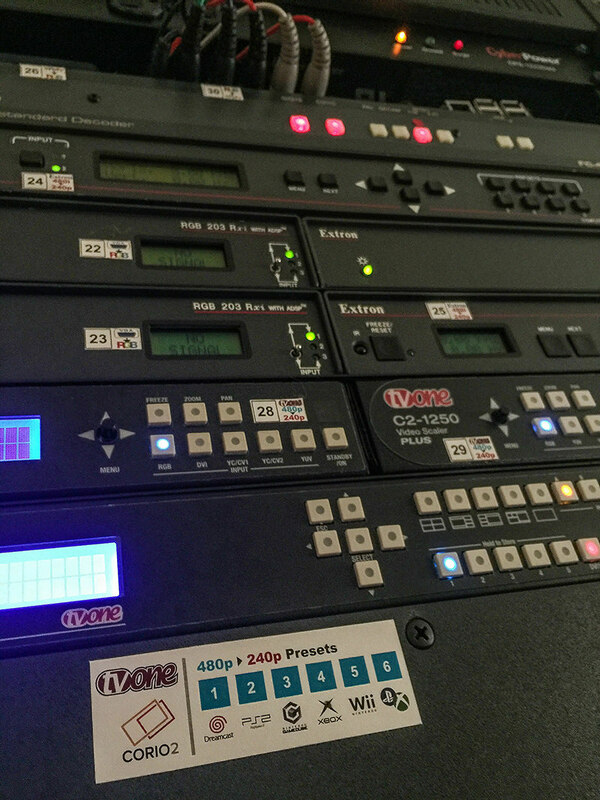 You have two ways to program the Corio2 for 240p output: plug it into a 480p display (since there’s no native 240p or 480i resolution on it in stock form) and scroll through all the menus to load in the 240p resolution number manually (tedious and error prone); OR use an inexpensive $12 USB to Serial programmer cable, and the free TVOne CORIOtools Suite - C2 Control Software. The latter is the way I highly suggest you go about this. I won’t lie, especially on first use I find the CORIOtools Suite to really be a pain to use. If you want to do it manually here’s a link to a text document with orange808’s original programming instructions (I added some notes in bold - I still suggest you read through that ENTIRE document even if you use my shortcut method - there’s some good info in there about tweaking the frequency on a per-console basis as well). If you want to do it the easy way, I’ve made an XML data file (it’s a zip file, please download from Google Docs and unzip - Google likes to make you open the XML file in a text window FYI) for both the C2-400 and the C2-2200A (and now the C2-750 thanks to davidwhangchoi), which you can very quickly load onto your device. It’ll give you 240p resolution presets for Dreamcast, PS2, GameCube, original Xbox, Wii, and one for HDMI systems. If you have trouble with this step (which is the hardest part of this IMO), you can also hook everything up, plug in the USB to Serial programmer cable, and through the CORIOtools Suite software get the unit to go into the 240p resolution, and change it to RGBS or YPbPr output (I’m still working on a video to show exactly how this is done, as to be completely honest I usually just poke around until I get an image on screen, then SAVE that setting like I show at the and of the video). Last edited by Dochartaigh on Tue Nov 27, 2018 9:40 pm, edited 5 times in total. To try to eliminate any confusion, there is a difference between the 7x 240p ”RESOLUTION PRESETS” you from my XML files, and the ”PRESETS” which are found under the very first “Adjust preset” menu. The first thing to note is I’m STILL trying to figure out exactly what settings the PRESETS save, but I’m hoping we can get the centering and sizing values in there since all systems can differ a little bit. Worse case, I think we can change the RESOLUTION PRESETS for each system to center each of them (which would be adjusting the front/back porches on the timings), then you’ll just have to manually bump up or down the Horizontal and Vertical scale/size on a per-console basis to get it perfect (don’t know if that’ll be saveable) - I’ll report back if I have any luck figuring this out more. If anybody has anything to add about how to do this PLEASE post. All this seems to save is the 240p resolution, and it saves if you have it set to output RGBS (or YPbPr/Component) which are the most important things so you get a picture. You can program these as you wish from number  onward (I would leave the first preset set to your “240p MASTER” resolution, and NEVER touch this preset so it acts as a failsafe). Last edited by Dochartaigh on Tue Sep 11, 2018 11:47 pm, edited 2 times in total. This section is a work in progress. Any tips/tricks people can add will be greatly appreciated. Centering the image is very easy. This was on my C2-2200 I currently have setup, but the C2-400’s menus should be the same. Go to “Adjust Sources” and change the settings for “TL pos.adj.” for up/down/left/right centering. For scaling, I have to admit (like I’ve said multiple times on Facebook and Reddit), that I’m still working on how to best scale. I have notes from orange808 and Xavier on how they scale the image, and will post them below. For scaling (or adjusting the margins to the entire image is visible), and I don’t know if this is the correct way to do this (and this is on my C2-2200 I currently have setup, the C2-400’s menus should be the same), but I was able to adjust the Horizontal and Vertical Size by going to “Adjust Sources”, and changing “BR size adj.” which can adjust (make wider, less-wide, taller, or less-tall). I’m still trying to see if this is savable on a Preset basis or not (so far I could only save it overall and it affected all Presets). I went to and from adjust sources and windows. The windows will adjust your borders, while the sources will align your image. This is all done with the understanding that the output resolution is 720 x 240. These results will vary with different resolutions, which I’ll want to try and mess around with in the near future. Once you have the borders to the max width, the picture needs to be moved within the borders. 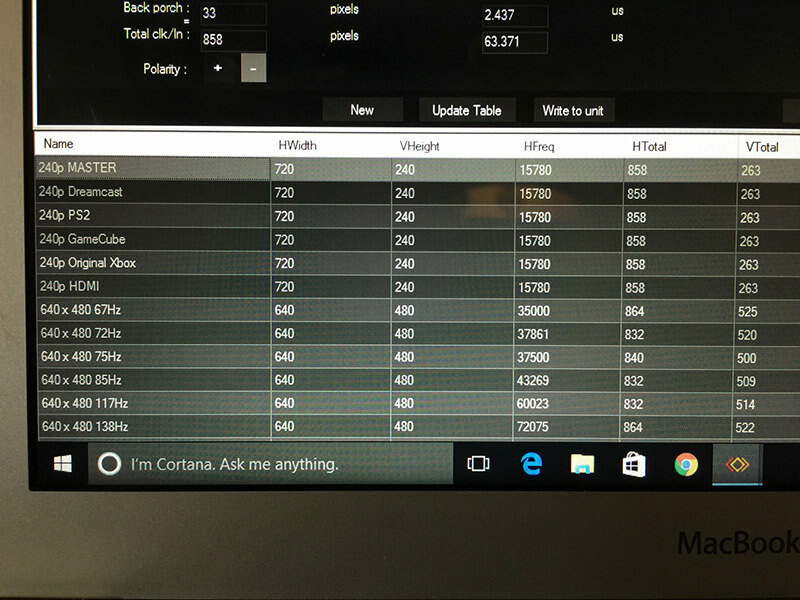 Use the Corio "autoset" feature. After it finishes, find Windows into the menu. Change the aspect change from Simple to Advanced. If necessary, use the horizontal zoom to adjust the horizontal size. Don't worry about centering the picture just yet. Don't touch anything with vertical settings here. Use the TL (Top Left) menu to adjust the vertical position and make the scanlines look right. Also use this menu to center the picture horizontally. To center the image on a downscaled image, you can just tweak the H/V start setting, for the size you want to change the H active setting instead. So that's about it. Please let me know if anybody has any additions. Thanks to orange808 and Xer Xian for their help along the way, and Xavier for forcing me to figure out how to get HDMI into these. Last edited by Dochartaigh on Wed Sep 12, 2018 1:21 am, edited 4 times in total. Seems to be somewhere around 1.5 frames of lag which I consider to be pretty darn good. Last edited by Dochartaigh on Wed Sep 12, 2018 2:13 am, edited 1 time in total. Many people don’t understand why anybody would want to downscale 480p (or 1080p) to 240p in the first place. For many it’s because we don’t like 480i flicker on our Standard Definition (SD) CRT’s. Those SD CRT’s do NOT take 480p input, so for 6th Gen consoles like Dreamcast, PS2, GameCube, original Xbox, even the later Wii, you’re stuck with using their native 480i output with all that flicker. BUT, since most of those consoles can also output 480p for most games (PS2 benefits from GSM - which isn't perfect at all FYI), there’s an alternative solution to get rid of the flicker: you can downscale 480p to 240p and then play these consoles flicker-free on your SD set in beautiful 240p complete with gorgeous scanlines. I specifically do this for my 32” PVM-3230, and my consumer Sony 27FV310’s because I prefer playing on a larger screen - especially for multiplayer games (even over my 20” multiformat BVM and PVM’s). People also downscale 480p to 240p because a good quality, larger, 480p+ capable CRT is REALLY hard to find. Multiple consumer models I've used haven't aged well at all (where SD sets have been very good to me). PVM/BVM's are super expensive. Even VGA PC monitors 20"+ are extremely hard to find anymore. So when you want that CRT glow, a SD CRT is a good easily available option. 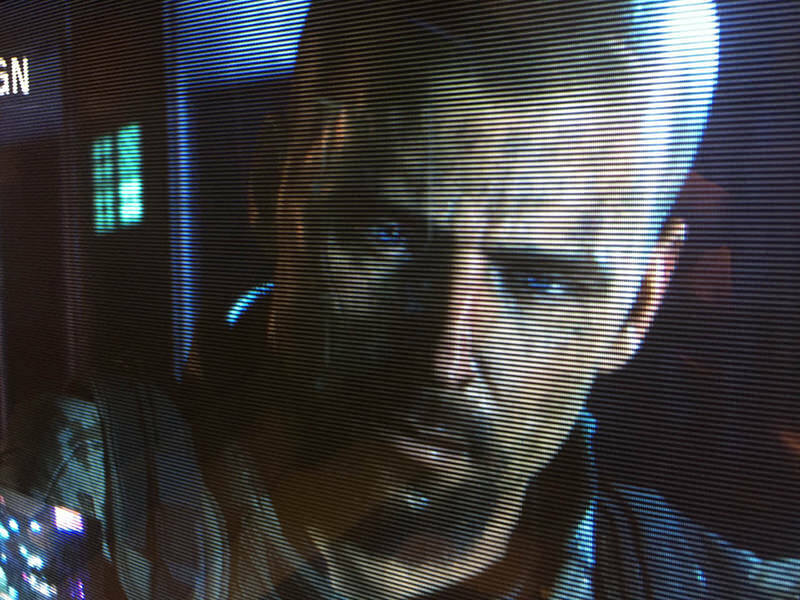 The other reason people may want to downscale (usually from 1080p) is they want to play retro-inspired games on modern consoles like Xbox One and PS4, but they want to play them on a CRT with scanlines for that truly retro-look. People who have PC's which can only output 640x480 progressive (480p) as the lowest resolution, and who don't have video cards/chipsets which can use CRTEmudriver or Soft15Khz custom drivers to output 240p, can also benefit from these Corio2's. My own personal "ultimate retro setup", and a good way to see how I integrate these 240p scalers into my setup. Last edited by Dochartaigh on Wed Sep 12, 2018 2:34 am, edited 1 time in total. 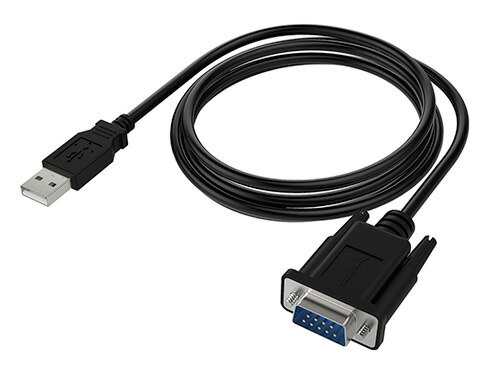 You may also want to add a note that any of these Corio 2 scalers with the "PC HD" input can also take S-Video and composite video over this connector. I believe the pinout is the same as what Extron uses, where composite and luma are on Green, and I believe chroma goes on Red. Understood, but Composite and S-Video can't output a 480p+ signal so there would be nothing to downscale with a Corio2. Upscaling, yes, they could do that – but most people I've talked to say there's better upscaling solutions for that (like a Framemeister or whatnot). Very nice! Thanks for the extensive guide! PS3 encrypts its HDMI output with HDCP (even for games), so the TVOne will accept it, but will deny output through an analogue connection. For HDCP, I honestly don't know a great deal about it (besides how it's for copyright protection and such). For the PS3, I just double checked my messages (and the screenshots one guy sent me), but their PS3's work with the Tendak HDMI to VGA adapter through the Corio2's (believe C2-400 model). I know Xavier had problems with his PS3 and his specific HDMI to DVI adapter, and used Component off the PS3 to feed into the Corio2 instead. The Tendak kills the HDCP encryption, so of course it works. HDMI to DVI leaves HDCP intact. Just wanted to say thanks for posting this full write up. Still loving playing my switch on my CRTs using the 400. Still can't believe how good Doom 2016 looks in 240p. How does it handle the conversion? I.e. Does it throw out every second line from a 480p signal or blend two lines into one etc? Does this offer any advantage over the other 480p to 240p solutions like the Emotia or Ultracade UVC? The others are all limited to one 240p res which isn't great on every game. Does this solution allow any sort of custom 240p resolutions? What about EGA? On my Ultracade UVC, I can choose either cga or ega output from 480p or 720p in. You keep posting that Curse of the Moon screenshot like it's a good example of 240p downscaling, but it's not. Top and bottom of the C show that there is some sort of bilinear filtering going on because there isn't a 1:1 line conversion. You can see that every line is clearly defined and doesn't bleed into adjacent lines. So yeah, there are many variables to consider before you run your video through the Coria, it definitely seems like the OP is either not setting it up properly, or the Coria isn't good for native-res 240p games. I'm not totally sure what's at fault here. Bilinear downscaling is fine for 720p/1080p content, if you're dead-set on 240p instead of 480i. So yeah, I'm just making sure we're promoting best-practices here. Just because you're sending non-interlaced 15kHz to a display, doesn't mean you've properly scaled everything and it's going to look proper old-school. It requires a bit of knowledge of how the games are running internally vs. what's rendered on the screen. On the shots above he's probably downscaling from HD and who knows how CotM handles 720p or 1080p. You were using a direct 15khz output from your PC ? If so, did CotM happen to run at that resolution natively ? If it does, then there's a very good chance that it does also run at an integer 2x at 480p output resolution. And if that's the case, then you can get pretty much perfect results using external downscalers like the TVOne or the others. That shot looks great. Could you post a shot of the logo screen if you get the chance at some point? If we have a base line for exactly what it should look like at 240p you could help us figure out what we need to do to the Corio to get perfect (or at least better) conversion for these types of titles. Having reference points can be a ton of help! Yeah, it ran at the resolution natively. 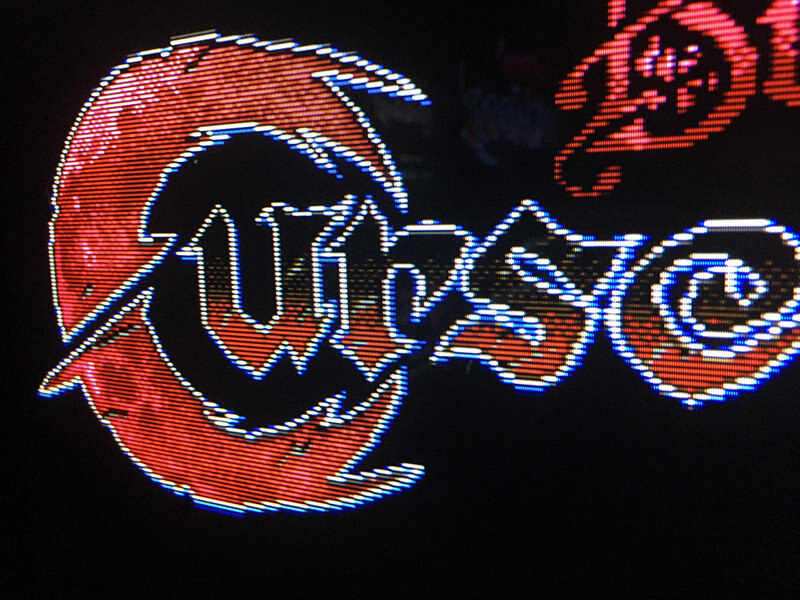 Curse of the Moon is a little weird in that it will try to run at the highest resolution your display supports, so I actually had to delete every resolution except for 400x240 using CRU. I could have also probably used GeDoSaTo to force 240p. 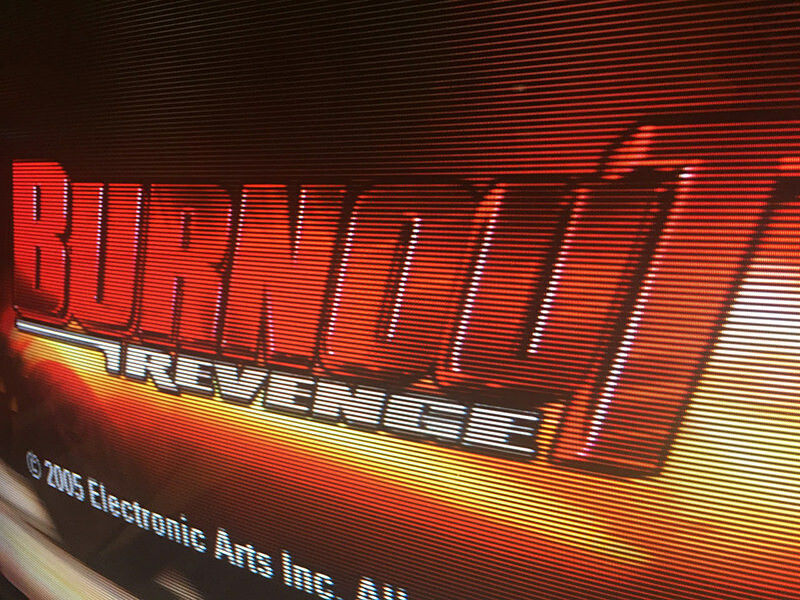 I haven't experimented with CRT_Emudriver either, so that might be the most hassle-free solution for these types of games. That shot looks great. Could you post a shot of the logo screen if you get the chance at some point? Maybe this weekend. It takes a little bit of time to set up, since I use my main PC and have to move it to my living room to do this. Hopefully soon I'll have a dedicated 15kHz PC built, for games like this and emulation. Your Switch screen should also show a perfectly line-tripled 240p. 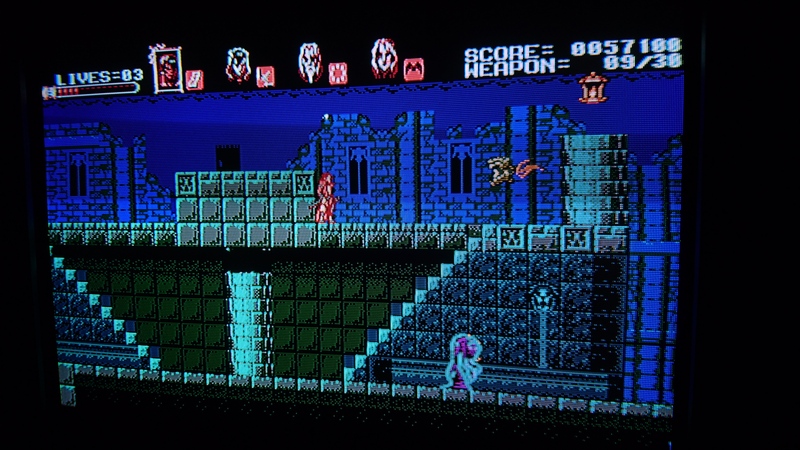 Last I heard, they were using 1:3 scaling for Curse of the Moon. Fantastic guide, thank you so much for sharing! EDIT: Found this for cheap on eBay, what do you think? It performs the conversion by averageing lines and this is also the way the Extron Emotia peforms the downscaling. The Corio2 machines are newer and less expensive. They have full uncompeessed 4:4:4 sampling, processing, and output. As long as your input is vertically sampled at exacly double your planned output, the Corio2 will output a very nice "one half" downscaled image. Bonus points: the machine can be used to mirror or flip the screen. It can also be used to drive an arcade monitor from Mame at other resolutions with some tinkering. Output timings are fully programmable. General upscaling quality aside, the Corio2 is the most programmable and flexible machine I have used--when it comes to setting the timing characteristics of the output signal. Also, the Corio2 doesn't force any filtering on you. You can turn it off. It will then default to a "next neighbor" algorithm. 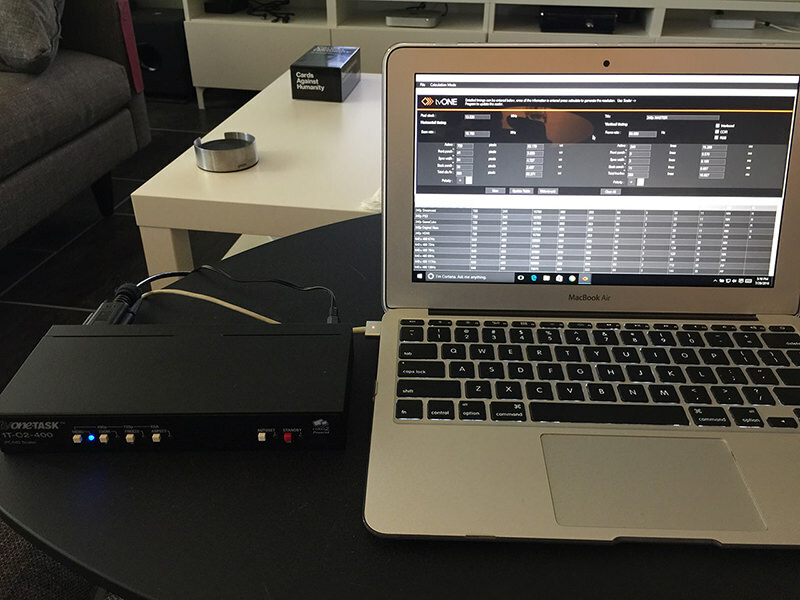 • Ability to input pretty much every high-quality signal type we use: RGBS, RGBHV (VGA), RGsB, YPbPr, and HDMI (with dongle). 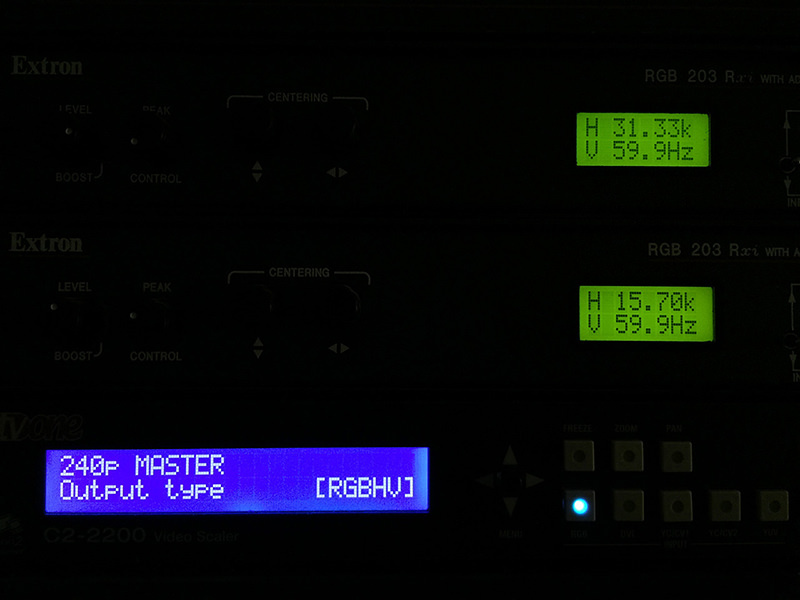 • Ability to output pretty much every signal type we use: RGBS, RGBHV (VGA), RGsB, and YPbPr (even HDMI if you wanted to). • Auto-senses those inputs so you don't have to ever tell it what signal type to expect. • Don't need something like an Extron RGB device to separate RGBS to RGBHV like the Emotia's do (at least one model I was told only takes RGBHV input ONLY). 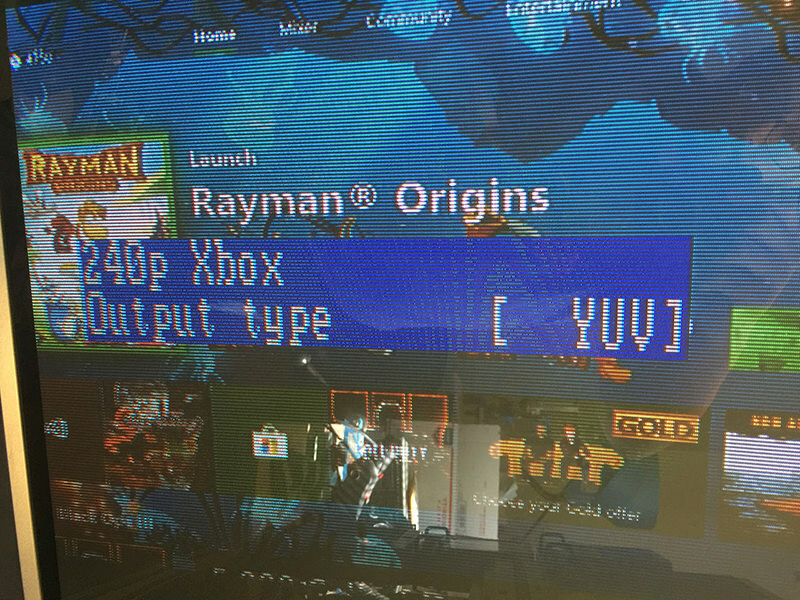 • Don't need a separate RGBS to YPbPr and/or YPbPr to RGBS converter on the input or output side to use that signal type (a la original Xbox, GameCube, Wii, --all systems with 480p over YPbPr usually; and on the output side that would be used to get the signal to super-common Consumer CRT TV's with only YPbPr inputs...Corio2 has all this baked in). • Can take up to 1080p (or even 2048x2048 from a PC the manual says) as an input, and output 240p. • Can also output any (within reason for this era) resolution you could possibly want, fully customizable. • Can also upscale (if you wanted to - never tried, and I was told it's not as good as some other commonly in-use devices). • MUCH newer than the Emotia (don't know when UVC made those) - just checked and I have a couple 2010 Corio2's. • Ability to save BOTH Resolution Presets, and Presets (although I'm still trying to figure out exactly what the 'Presets' save). • Can interface with your PC, and be controlled via remote control (some models). • Lower price than many of these other options (although cheapest compatible model I see on eBay now is $100 - people were getting them for under $50 shipped very recently). ...that's it off the top of my head. You keep posting that Curse of the Moon screenshot like it's a good example of 240p downscaling, but it's not. I've never even heard of that model so I would stay with the ones I listed as known-working. I would say under/around $100 USD and you have a pretty darn good deal here. Ha! Yeah, I've got one of those too. I'm just a psycho and want to play games in an alternate reality where we still use tube sets some times. Don't get that one - beside RGB, it has composite and s-video outputs (connectors marked with grey are outputs), which makes it very likely that it comes with the castrated 'down converter' firmware, which means no 240p output. The supply of 240p-able Corio2 on ebay has nearly dried up now. There's a brand new 1T-C2-750 on ebay.co.uk, if you can haggle it down to £100 or so it's a decent buy. The C2-750 is among the few 240p- able Corio2's to have digital input and output. If you have an OSSC, maybe you could also wait for updates on that front - it seems that marqs will look into adding a 480p to 240p mode in the coming months (see recent posts on the OSSC thread). what he actually said is that the current hardware can't do it, due to the 525 to 263 lines conversion mismatch. If it was done on the current hardware the output timing would be rather imcompatible and probably only useable on a few monitors. Eh, looks like I can't find anything sub-€150... guess I'll wait or pass on this one. Or wait for developments on the OSSC. I picked up a C2-1200 that looks like it can do 240p output; I can configure the 240p resolutions, and it can sort of work over VGA on one of my LCD monitors, but I haven't tested it on my CRT (Which is not currently hooked up). I was following orange808's documentation, and I got stuck on a few parts. First, the instructions seem clear to me right up until "Make a copy of your new resolution and name it 240p PS2". It's not clear exactly how to do that, since it sounds like there's some kind of copy or clone button, there doesn't seem to be anything in the UI to do that. Is it that we need to manually configure each of these resolutions, or is there a clone function that I'm not finding? Next, when the instructions say "Make sure the output is set to YUV for component output", and later "Using the Corio Suite software, create a preset to output your 240p using YUV", where do I need to do this? If I'm following the instructions sequentially, I'm still in the Advanced Create & Edit Resolution dialog, which doesn't have a clear output type setting. Do I just need to uncheck "RGB", or do I need to save my changes and wade into the Basic section? Finally, how, exactly, do I create a preset? When I go into Presets, it looks like I can store current settings and execute presets, but not actually configure what's in those presets. Do I need to have both Presets and Basic open at the same time; then, in Basic, select a resolution and output type; then, in Preset, store as Preset N? And is the scaler supposed to always boot to Preset 1, or does it boot to the last-used preset, or none at all? 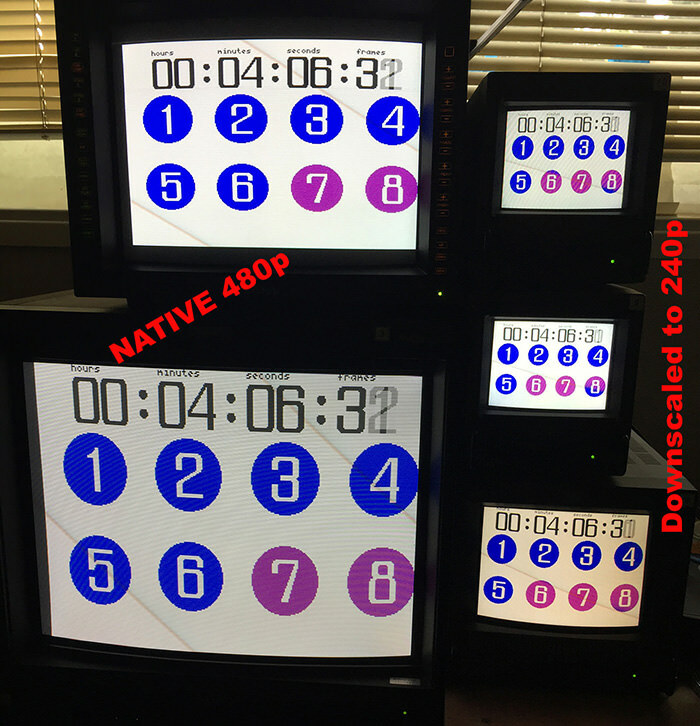 Can your LCD monitor handle a 240p resolution? I guess it has a built-in upscaler or something? Just curious as most can only take 480p at the lowest. Did you find orange808's directions on another post here, or use my link above where I put some notes in bold? I ask because I noted I also have problems making new resolutions (the TVOne software really is simply bad, and non-intuitive), and that for our 240p resolutions we're going to add, I overwrite the resolutions immediately after the NTSC and PAL resolutions instead (and have a note in there about how to NOT overwrite the NTSC/PAL, EVER, or it'll brick the unit and you'll have to reinstall the firmware). Anyway, I HIGHLY suggest you follow the directions above and use my .XML file instead of trying to type in all these resolution values on your own. I would probably use the version for the C2-400 for your C2-1200. Worst case if it messes up, you would just have to reinstall the firmware again and start over - which reinstalling the firmware should be your VERY first step anyway so you would have everything on hand needed to do that, then go through the painful process of manually inputting these 240p resolutions through the software. The place to change the output isn't on the same resolution page where you're adding all the numbers for the 240p resolution. It's on another page on the software (want to say in one of the top row of icons - I forget which to be honest), but like I note this seemed to be iffy if that change would take (so I took a video on an alternative way to do this). I HAVE however had luck, when the Corio2 is hooked up to your C2, in using the software to put it into RGBS mode (or YPbPr/YUV mode) simply by poking around (i.e. trial and error) until you get an image on your screen (this I also note I need to more concretely find this out so I can add it to the tutorial as that will save everybody time and effort). 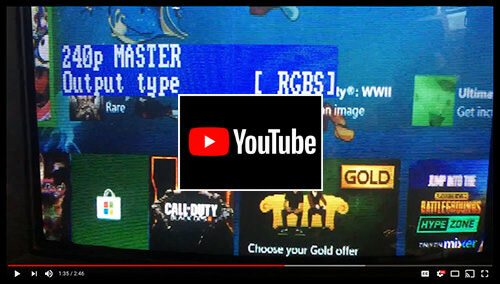 For the video I just mentioned, that shows how to switch to RGBS/YPbPr output on your CRT itself so you can change it from the default RGBHV output to RGBS or YPbPr (like I note, it's a pain which is why doing it through the software, once we figure out those exact steps, will be a LOT easier). nmalinoski, my friend, please give the entire tutorial above a read - it goes into detail about this in both a YouTube video, as well as a section called "A note on “RESOLUTION PRESETS” and “PRESETS” (they’re different!!! )", and how to save your preset so the unit ALWAYS initially boots into your 240p resolution, with whichever output type you choose. NOTE: this should work on your C2-1200 as well as it's nearly the same series as the C2-400. Some of them, like the C2-2200's, they make this saving of the preset a little easier where you can hold the joystick in until it beeps and it'll save the preset – give your specific manual a read if you want, but I believe all the Corio2's have the menu option I mention where you can save the preset that way without fault. Granted, as I mark above we're still trying to figure out exactly what it stores in the Presets menu (the "Adjust Preset" menu where you choose which "Resolution Preset" it loads --the 240p one--, and which output type), but this at least will have it boot in that 240p mode all the time. If you figure any of this out any more PLEASE let us know - it's still a mystery to me exactly what the Adjust Preset/Preset saves, and it would be amazing if we could save all our centering and scaling on a per-console basis most definitely. Also, if there's any way I can make the above tutorial more clear please let me know - I'm totally open to editing it for all our benefit. These things really aren't intuitive so I completely understand having questions like you have, especially since my first time doing this it took hours upon hours before I got a nice stable picture (whereas now, with those .XML files, I can literally get one up and running in under 5 minutes - the initial hump in figuring all this out can be a bit much). Last, when you get yours working on a 15khz/SD CRT please let me know so I can add the C2-1200 to the list of working models (I own a couple 1250's which I know work so I have faith that yours will too). No, it doesn't support 240p, as far as I know. I have 480p over HDMI from my N64 going into a Portta HDMI->VGA converter going into the C2-1200 going into AV3 on my OSSC going into DVI on my Dell U2410. 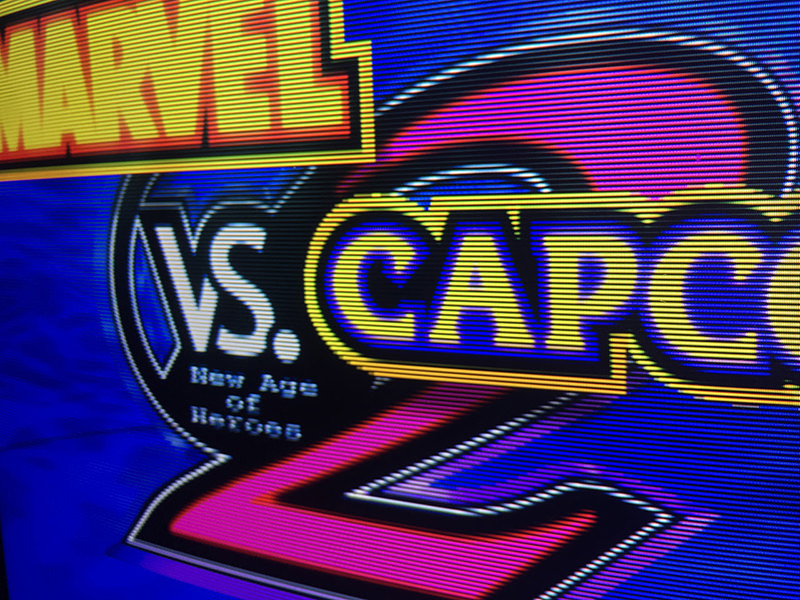 The C2-1200 is supposed to be downscaling to 240p, which the OSSC should bring back to 480p so my monitor will actually display it (ideally). I followed your annotated version of the instructions that are linked above, and I did modify the few resolutions immediately following NTSC and PAL as you did. I did watch both videos, but neither demonstrates how to configure or save profiles on my own using the software. I absolutely agree that the software is unintuitive. As far as I can tell, the only place where I can configure both Output Resolution and Output Type is in the Basic Control section (Which first row, all the way to the right). When I change resolution and preset in this dialog, they seem to change on the device as well; so, when I change to 240p MASTER and YUV, my OSSC displays "AV3: YPbPr 263p / 15.78kHz 60.00Hz". My monitor apparently doesn't care for this resolution, but the OSSC seems to be reporting it correctly. I also set Source to RGB 1, but it doesn't seem to be doing anything. Unfortunately, it's not clear what to do from here. I know my device is saving the resolutions just fine, but not the configuration presets. I'll give your XML a shot.